The Endo Blog: Are Implants the Future of Dentistry or Just a Step Along the Way? Are Implants the Future of Dentistry or Just a Step Along the Way? The real future in medicine and dentistry is in regenerative therapy. While restorative materials including cements, resins, rubbers, metals, titanium etc. are the best materials we currrently have to replace damaged, diseased or missing teeth, the big picture is to replace damaged tissue with regenerated tissues. The dental pulp stem cell has been identified as a source undifferentiated mesenchymal stem cells which may have ability to differentiated into cardio-myocytes, neurocytes, myocytes, osteocytes, chondrocytes and adipocytes. So while our current restorative materials/techniques are the best available in the world, the future of dental care is tissue based rather than titanium based. While regenerative treatments in dentistry are still years, perhaps decades away, endodontists are beginning to explore this area with what is called pulpal revascularization. This concept of taking a necrotic pulp in an immature root and stimulating revascularization of the pulp canal to allow for continued root development. Yes, I said continued root development. That is a completely new concept. This 9 year old was at home and jumping on the bean bag and someone pulled it away, caught his tooth and completely avulsed tooth #8. It was out of the mouth for 20 minutes and properly replanted by the pediatric dentist. A couple weeks later, symptoms presented. 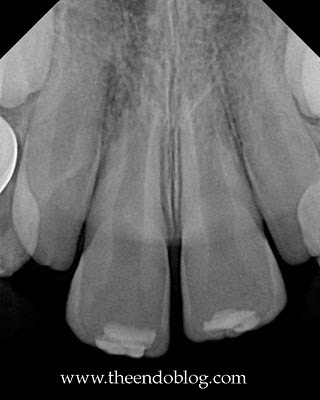 The tooth was opened, debrided and pasted with Ca(OH)2 paste. 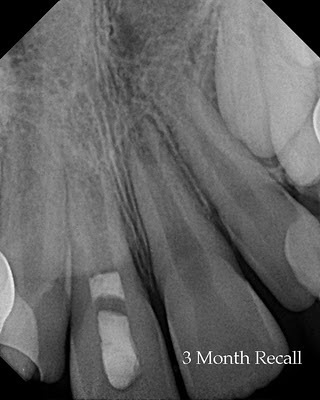 At 3 month recall the tooth is asymptomatic and pa lesion has resolved. At 9 month recall the tooth is asymptomatic and fully functional. No percussion pain, normal probings and NORMAL RESPONSE TO EPT. While there is no reaction to thermal testing, there is definitely a normal response to ept. 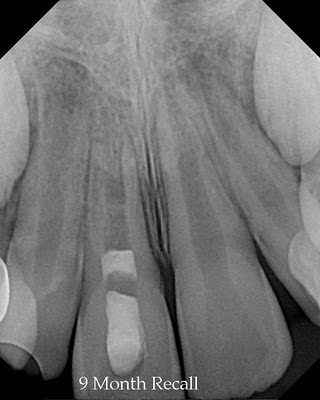 Looking closely at the radiograph you can see that the dentin walls in the apical portion of the root have thickened and there appears to be dentinal bridging forming in the mid-root area. While this procedure has also been called pulpal regeneration, some argue that it should be called pulpal revascularization. It is not completely known what type of tissue that is growing into the canal or the source of that tissue (cells from within the canal or migrating in from the periapex). The continued development of the root and healing of the lesion however, is not debatable. This type of novel treatment may give us a glimpse of the future of dental treatment using tissue regenerative techniques rather than artificial tooth replacement with traditional restorative materials. For more information regarding the considerations of this procedure, click here. To see more cases of pulpal revascularization, click here. A good article that talks about whether implants are the future or just one step on the way. I have been reading about this in the recent literatures. Very interesting indeed. However, do you know if there has been any studies on the prognosis or success rate of pulpa revascularizations? I am not aware of any studies showing success rates yet. This is new enough that we are submitting cases to AAE database for study. I have cases back as early as 2003. 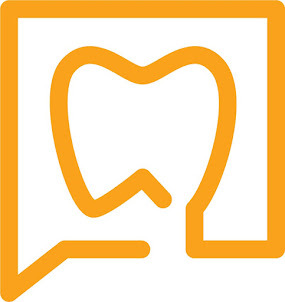 There is lots of information available in the Journal of Endodontics. Great and exciting stuff from our endo brothers. Just wrapping up my last year of dental school. This is the stuff which is driving me to pursue an endo residency. Some truly superb information and very useful. Nice review. Thanks for posting! I think this is just a step along the way. Procedures and the technology involved are constantly improving. As the article itself said, regenerative techniques, while at least a few years away, are already in the works. Surely, we hope that the future will come with a better product. Innovation is always there. Pray for the best! Fantastic post!! Thanks for sharing this fabulous information.